<i>Digital Foundations: Introduction to Media Design with the Adobe Creative Suite</i> integrates the formal principles of the Bauhaus Basic Course into an introduction to digital media production with the Adobe Creative Suite, or the FLOSS graphics applications. Textbooks and software manuals in the current market do not include art and design history or visual principles. These books synthesize historical examples and traditional studio foundation exercises into smart, well-paced digital studio exercises. See it for yourself in Chapter 5 of Digital Foundations, where we explore Illustrator's Color Picker window through Joseph Albers’ color exercises. Digital media texts about Adobe Creative Suite, whether they are “Bibles”, “For Dummies” or “Classroom in a Books”, focus on tools and production tips. Digital Foundations is the only textbook that teaches visual skills through production tools. For example, look at our Table of Contents. It is organized by visual topics, including symmetry, line art, tonal scale, elements of motion, and more. Digital Foundations is not specifically for dummies or classrooms. It was made for self-learners, artists, designers, as well as classroom applications. We wrote this book for our classrooms as well as for our parents! *In Winter 2013 we updated the wiki for Adobe Creative Suite 6. *The text was originally written in 2008 for Adobe Creative Suite 4. "This ambitious book teaches visual thinking and software skills together. The text leads readers step-by-step through the process of creating dynamic images using a range of powerful applications. The engaging, experimental exercises take this project well beyond the typical software guide." "This groundbreaking text applies the classical Modernist pedagogy of the Bauhaus to digital media. It's a must-have for every art student, design student, and new media maven." "Everyone should use this book: it really combines design principles, software tutorials and Bauhaus history. And it's open source!" "This book is an unprecedented bridge between how visual design was once taught and how it needs to be taught today. It decodes digital tools and culture while explaining fundamental visual design principles within a historical context." "This book is the perfect fusion of technical and formal instruction. It gives the lie to those who think you can learn to use the Adobe Suite of computer applications effectively without an art education, and opens the door to a more practical understanding of the importance of artistic practice in our culture." </p><p><i>Digital Foundations: Intro to Media Design with the Adobe Creative Suite</i> is published by New Riders/AIGA Design Press, and licensed under a Creative Commons (CC BY-NC-SA) license. </p><p>All subsequent work FLOSSified by FLOSSmanuals and written by xtine burrough &amp; Michael Mandiberg is licensed under a CC-BY-SA license. 2 What is Digital Foundations? Digital Foundations: Introduction to Media Design with the Adobe Creative Suite integrates the formal principles of the Bauhaus Basic Course into an introduction to digital media production with the Adobe Creative Suite, or the FLOSS graphics applications. In Winter 2013 we updated the wiki for Adobe Creative Suite 6. The text was originally written in 2008 for Adobe Creative Suite 4. 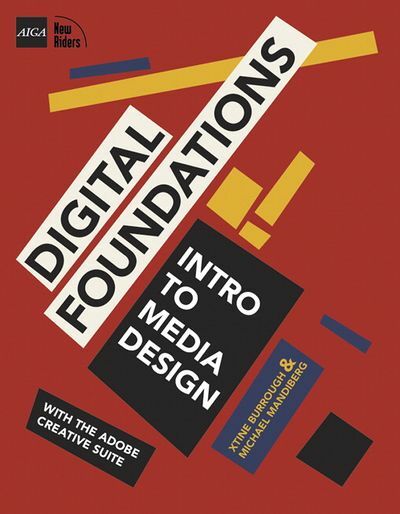 Digital Foundations: Intro to Media Design with the Adobe Creative Suite is published by New Riders/AIGA Design Press, and licensed under a Creative Commons (CC BY-NC-SA) license. All subsequent work FLOSSified by FLOSSmanuals and written by xtine burrough & Michael Mandiberg is licensed under a CC-BY-SA license. This page was last modified on 17 January 2019, at 21:00. This page has been accessed 899,761 times.